What is more important, the institution or our vanity? The Masons are not alone in this regards as I have seen similar situations in other nonprofit groups. For example, I remember attending a party when I moved into my neighborhood and a man approached me with some swagger saying, “Hi, I’m John Doe, President of the homeowner association” (it was kind of like, “Hi, I’m the Head Raccoon”). He winked at me, then turned away to glad hand someone else. Frankly, I burst out laughing as he thought he was impressing me. In reality, this same gentleman ran the homeowner association right into the ground and nearly bankrupted it. At some of the I.T. related associations I was involved in, there would be the usual officer titles, such as President, Vice President, Secretary, and Treasurer, but then there are higher titles such as “Division Director” as you now oversaw several chapters as opposed to just one. There are other names for this, such as “District Deputy” or “Inspector,” but you get the idea. Such titles denote a loftier position and are either given to people to perform a legitimate responsibility or awarded as gifts to cronies. I have seen people “Chasing Aprons” in just about every nonprofit group I’ve been involved in, be it fraternal, political, professional, educational, even in sports clubs, such as those related to baseball, softball, football and soccer. I have found people who covet such titles tend to be more consumed with the title, and less about the responsibility associated with it. This is essentially no different than in business where people yearn for a job title for political reasons as it will look good on a resume. I tend to see such people as rather shallow. They never accomplished anything of substance in their life, so the appeal for recognition through titles and aprons is irresistible to them. Whenever I run into people like this, who obviously don’t know what they are doing, I tell others to give the person the title or apron and get them out of the way as they will only inhibit progress. As an aside, I wonder how many people would volunteer their service if there wasn’t a title or apron involved? It would be an interesting experiment to see if people care more about the institution they belong to or are in it for themselves. Obviously, this is all about the human ego. In Freemasonry, we are taught the importance of the title of “Brother” as it is a fraternity, a Brotherhood. There are many other impressive sounding titles associated with the Masons, but nothing more important than the simple designation of “Brother” and the plain white leather apron. Just remember, being called a “thoroughbred” doesn’t change the fact that a jackass is a jackass. In the UK we have many “dark blues” who are in all honesty crap masons but who have nice deep pockets. I have always said that masonry is like fishing, you can be content with a stick and piece of line or you can be a blue water fisherman on a gin palace, if chasing honours and buying respect is your thing then masonry is for you. If learning your ritual and being a productive member of your lodge is your thing..then masonry is for you too. The main thing to remember is that masonry is not exempt from having issues of vanity, pride, nepotism and so on, it is also not exempt from having humanity, kindness and earning respect from your peers, why? because Masons are humans, at the ned of the day if we all like fishing what’s the problem. Very good point Brother Isbitt. (Written from the perspective of the Masonic experience) I believe that the criticism is legitimate: we’ve all run into that sort in Lodge and elsewhere. As recently as a year or so ago, I had a Brother suggest that it was necessary to put the spotlight on oneself “in order to advance.” I’ve tried to distance myself from the person since! 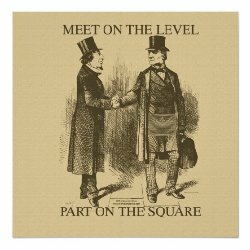 I would, however, point out that the titles and distinctions (the “aprons”) being sought after are matters of very long standing…many, many decades…and so a phenomenon considerably predating the Craft’s current circumstances and encompassing a time of much greater success in the fraternity. My own assessment: a superficial issue, but hardly the crux of the current problems! It is my experience that the vast majority of those who earn these honors are men of excellent character, whose often tireless work on behalf of the Craft have earned them the accolades they wear…generally with humility and with more honor to the fraternity than to themselves. They may be “guilty” of coveting the notoriety of a shrinking body of Masonic membership, and they may be fighting “on the wrong ground,” in terms of their understanding of the real issues. Nevertheless, misguided or not, their ambition is hardly the core of the problem! To me, the primary difficulty within the Craft today is summed up in eight words: “We do not deliver upon what we claim.” There is little in either the ability to attract or to retain active membership that cannot be traced back to that statement. Tim, with all due respect (and I hope you’ll agree that past comments, in a number of conversations, prove the sincerity of that disclaimer), I don’t see how the point of view of a commentator who has made considerable “book” on the perspective of “Why I Don’t Attend Lodge” has much to offer on the underlying difficulties of the Craft! A Brother who has found sufficient fault with the institution not to be “in the trenches” and fighting the day-to-day battles might, I’d think, be satisfied to observe the decline of the institution from which he has chosen to distance himself in all but name! Yes, I have been through the wars and am now heading out to pasture Masonically. What triggered this piece was when I saw it in a political organization. I realized what was going on there was essentially no different than what happens in a Masonic Lodge.